There is a new way to share Highland pony news, photos, questions and comments directly with other SHPSNA members. Click here for the SHPSNA yahoo discussion group. Exciting news for all the Mountain and Moorland breeds in the US: The National Pony Society in the UK has approved the formation of an overseas chapter! The endangered breeds invited to participate are Dartmoor, Exmoor, Dales, Fell, Highland, Gotland-Russ, Newfoundland, Caspian, Akhal-Teke, Canadian Horse, Cleveland Bay, Irish Draught, Lippizan. 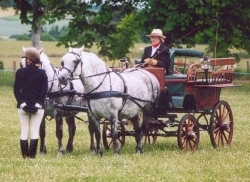 Judges include Lendon Gray (dressage), Muffy Seaton (driving), Christine Robinson (Mountain & Moorland). Mountain & Moorland classes with a UK judge will be offered again this year, these classes are scheduled for September 12. There is a possibility of an additional day of performance classes for M&M breeds and partbreds--if you are interested please email SHPSNA secretary or contact the show organizers as soon as possible. We need numbers to make it happen! Bridget of Moonshine Glen with her owner Michelle Foster. Michelle plans to do combined driving and dressage with Bridget. Bridget is a daughter of the renowned stallion Fyfedene, a prolific show winner in the UK and recently imported to Australia. Look for Michelle and Bridget in the show ring in the future! The 2007 M&M shows were well attended with two new venues in Oregon and California adding these classes. Pictured below are Jill Mueller's ponies Bridget and Heidi showing in the M&M classes at the West Coast Connemara show. Bridget placed second and Champion Highland, and Heidi placed fourth, under well known UK judge Linda Impey. The show had a strong turnout of 17 Mountain and Moorland entries. Congratulations to Jill and also to Bridget's new owner Michelle Foster! The article below was published in the November/December 2006 issue of Paisley Pony Magazine. We still have a few extra copies of the magazine. Please email if you would like a copy. More about the show can be found here: M&M show news. 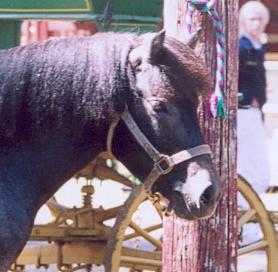 Labor Day weekend 2006 saw a landmark event for British native pony enthusiasts on the west coast. For the first time ever in California, Mountain and Moorland pony classes were offered at a show, giving owners and breeders the opportunity to exhibit their ponies in the traditional style of their homeland. The term "Mountain and Moorland" refers to native pony breeds of the British Isles; Connemara, Dales, Dartmoor, Eriskay, Exmoor, Fell, Highland, Kerry Bog, New Forest, Shetland, and Welsh. These breeds are all unique, having ancient roots tracing back thousands of years in their home territories, yet also share many traits in common. The similarities in type and conformation between the breeds reflect the wild habitats in which they evolved. The rugged mountains and rough moorland environment of the British Isles molded these hardy ponies for eons, with little or no human influence or selective breeding until very recent times. 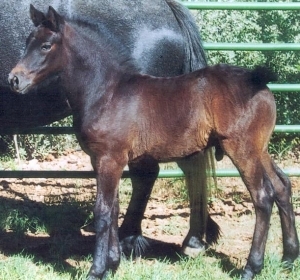 Today few native ponies remain in a truly wild state, but many breeders still raise them in their traditional habitat, where they live out year round in the harsh conditions on the moors and mountainsides, keeping the breed type true to their wild ancestors. Although several of the Mountain and Moorland breeds are now quite rare, and some even in danger of being lost entirely, the genetic diversity and invaluable equine heritage represented by these native breeds is well recognized in the Britain. The Rare Breeds Survival Trust is working to insure that these unique pony breeds will survive in the UK, and currently their watch list includes Dales, Dartmoor, Eriskay, Exmoor, Fell, Highland, and section A Welsh. Laurelhighland Rose Petal, Fell Best of Breed and Reserve Champion M&M. Photo courtesy of Rene' Bender, Fell Legend Farm. 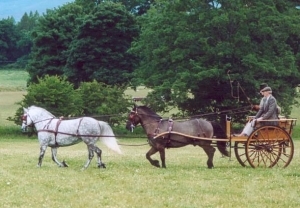 At many shows throughout Britain mixed Mountain and Moorland breed classes are offered to allow the native pony breeds an opportunity to compete against their peers. Some of the lesser known breeds are rapidly gaining popularity due to this show exposure. Breeders in North America have long wished for a similar show venue, and with the increased interest in preserving these versatile pony breeds it seems the time is finally ripe for the expansion of Mountain and Moorland classes. 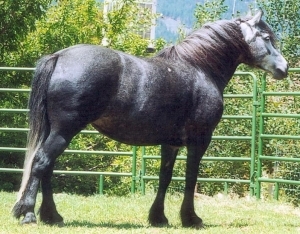 All the Mountain and Moorland breeds except Eriskay are currently represented in the U.S, although several of the rarer breeds have just a handful of ponies on this continent to date. Ceol Beag Lismore, Highland Reserve Best of Breed. Photo courtesy of Kathryn Rayner Freeman. 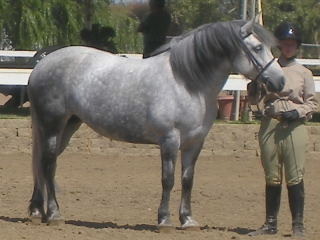 In the ridden classes, the ponies walk, trot, and canter on the rail and are also asked for an individual show. The individual segment of the class is the real determination of placing, as the judge's full attention is focused on one animal at a time. There is no chance the judge will be looking the other way if horse and rider are performing poorly, as can happen when all the ponies are on the rail at the same time. 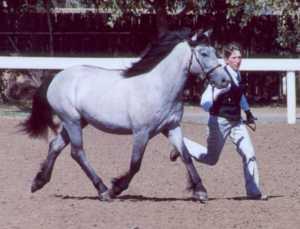 The individual show often includes walk, trot, and canter but much is left up to the rider in terms of choosing a particular ridden pattern or concentrating on a particular gait that will show off their animal to best advantage. After the individual performances, saddles are removed and each pony is assessed for conformation before the judge's final decision is made. The ridden class is judged quite differently from an American style pleasure class. Most judges prefer to see an animated pony moving with impulsion. 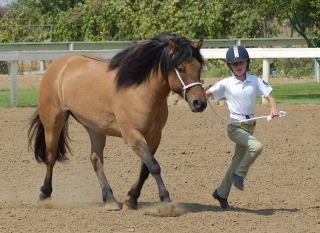 A little buck or other exuberance on the part of the pony will not necessarily lower the placing, if the overall performance reflects good showmanship. In many ridden classes in the UK, rather than asking each rider for an individual show, the judge personally rides each horse and a class is won or lost based not on how well a horse performs for the familiar rider, but for a judge who has never ridden the animal before. Another interesting difference in the UK style ridden class is that a true gallop is called for, not the hand gallop that most American hunt seat riders are familiar with. A fast and very dramatic gallop and an eye catching extended trot can win the class over a correct but dull working trot and hand gallop. The Mountain and Moorland classes in California were a resounding success with a very strong turnout for a first time event. 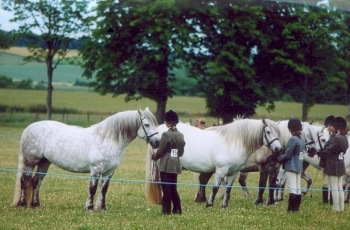 A total of 18 ponies entered representing the Connemara, Fell, Dales, Highland, and Shetland breeds. The judge was Mr. Simon Bigley, of the Llanarth stud in Wales, who is on both the Welsh breed judge and Mountain & Moorland judge panels in the UK. 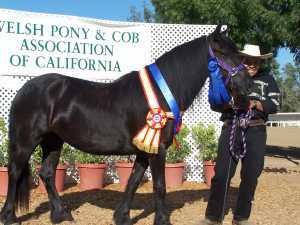 Connemara breeder Kathryn Rayner Freeman helped organize the event, which was hosted by the Welsh Pony and Cob Association of California at the Welsh Western Nationals show in Elk Grove, California. US owners were delighted with the opportunity to show under a knowledgeable UK judge. Where formerly no show venues existed, this event seems to have been a stepping stone to many similar events in the future. 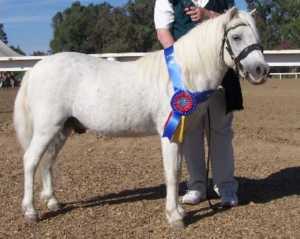 Thunderhead's Little Tex, Shetland Best of Breed. Photo courtesy of Ceci Graham-Widby. Already a repeat of this year's show is planned, along with several other shows confirming plans to add similar classes for next year. An even larger turnout with more breeds taking part is expected in the future. Many spectators at the show commented that they had never before had a chance to see these breeds in person, and how interesting the mixed Mountain and Moorland show format was to watch. The positive response to the September show was well noted, and numerous show organizers on the west coast have expressed interest in adding similar classes to their own events. This is proving to be a very exciting time for all the British native pony breeds here in the US, as general interest in the Mountain and Moorland breeds and show opportunities begin to expand and blossom. 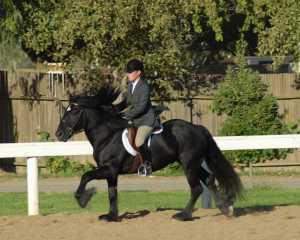 The M&M ridden champion went on to compete against the Welsh ridden champions for the Overall Ridden championship. The M&M in hand champion went on to compete against the Welsh in hand champions for the Best in Show. SHPSNA is sponsoring the Mountain & Moorland youngstock class at the West Coast Welsh Show, April 29 and 30 in Roseburg Orgeon. Wendy Rowe of Lone Tree Farm is sponsoring the Mountain & Moorland 3 and over class and donating a prize for the Ridden Champion. Click here for Wendy's news from the show. 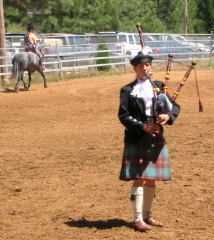 April 29 and 30 Jill Mueller's Highland ponies will be greeting the public at the Woodland Highland Games near Sacramento California. Western states Highland pony breeders Jill Mueller and Wendy Rowe joined forces for a breed exhibition at the Nevada County Fair in Grass Valley, California August 12-14. Getting 2 breeders of Highland ponies in one location was no small feat considering the distances involved. Jill of Moonshine Glen Highland ponies in Washoe Valley, Nevada traveled 3 hours with her 2 mares and yearling colt to get to the fair. 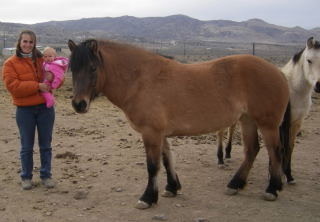 Wendy Rowe of Lone Tree Farm in Boonville, California traveled 7 hours with her 2 mares. 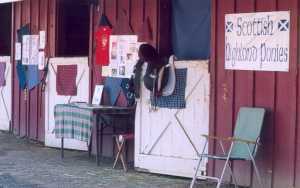 The crowds of fairgoers enjoyed daily exhibitions of Highland ponies in the arena, and hundreds of people visited the barns to meet the ponies in person. bagpipe tunes played by Wendy. Jill's yearling colt Captain Moonlight of Moonshine Glen was much admired by the spectators. 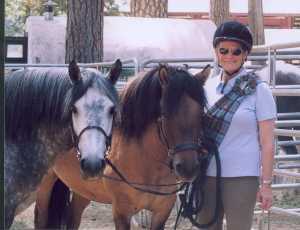 to the strains of "The Flower of Scotland"
Jill with her two mares Heidi and Bridget. see lots of new enthusiasts wearing them! 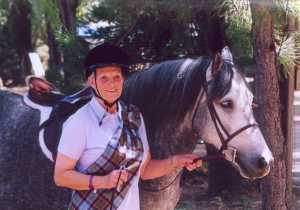 at Dressage at Devon, to be held September 30, 2004! 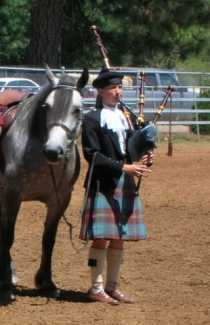 Jill Mueller's Highland ponies will make a public appearance at the Nevada County Fair August 13 and 14. She has scheduled a showing of them at 4 PM Friday and 12 noon Saturday. If you are in the area, plan to come meet Jill and her ponies Heidi of Whitefield and Captain Moonlight of Moonshineglen in person! 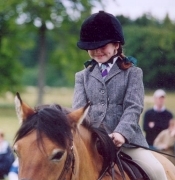 Jill Mueller took these lovely photos at the 2004 Highland Pony breed show in Scotland. 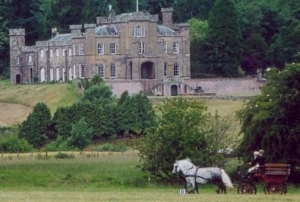 Strathallan Castle in the background. © 2000-2007 All rights reserved.